I can’t remember where I heard about this, but apparently Oreo is trying to cash in on the whoopie pie fad by introducing a variation they’re calling “soft cookies.” They’re also trying new ways to appeal to the growing Asian market (even including directions on how to eat an Oreo in their ads and packaging). I was shopping in the Japanese foods aisle of my local supermarket and I saw a bag of these in matcha, or green tea, flavor, and being as I have developed an enormous sweet tooth over the past 8 months (and have always been a sucker for novelty snacks), I couldn’t resist picking up a bag. As you can see, they’re basically itty-bitty whoopie pies. The cookie portion tastes like, well, a soft version of the Oreo Original—not very sweet, with a hing of chocolate. 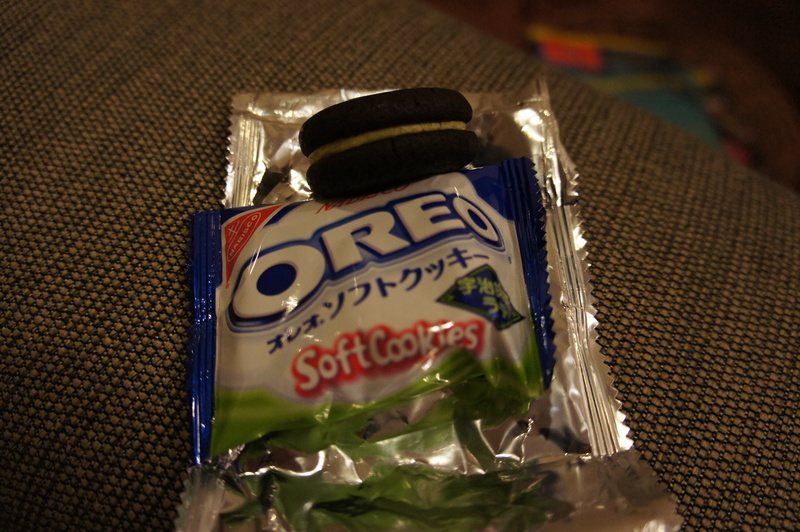 The filling is also surprisingly restrained in sweetness, with the pleasant bitterness of green tea, and has a more whipped texture than the paste in the middle of the Oreo Original. The cookie could stand to be a bit softer, and I wanted more filling, but I think Oreo has something going here. I’m one of those freaks who likes the cookie portion but not the frosting. Though my mother would never have allowed Oreos in the house, I did get them occasionally at school (or at my after-school program), and I would try to find someone to split them with, or try to peel off the offending layer somehow. Needless to say, I am not a fan of Double Stuf. 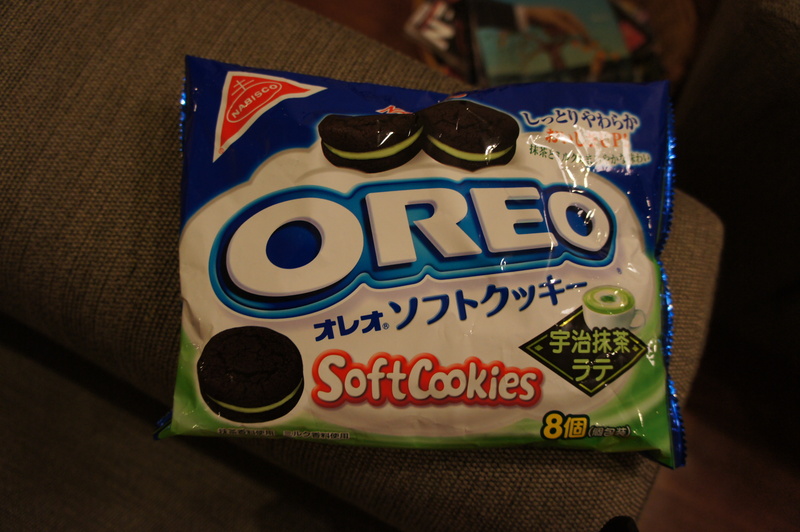 I don’t know if the green tea flavor is limited to the Asian market, or if the Oreo Soft has debuted in the US at all. Maybe one of my Western readers could do some reconnaissance?